With three potential pacers down from what was supposed to be their original tour squad, Sri Lanka's coach, Graham Ford, is concerned about the lack of available fast bowlers in the team. The former South African first class player, Ford, referred his side’s lack of fast-bowling depth as “alarming” after they lost two quicks to injury while another has been reported with a suspect bowling action on their England tour. Dhammika Prasad, who was the lead architect of Sri Lanka’s famous series win on the 2014 tour of England, sustained a shoulder strain during one of the practise games against Essex before the beginning of the Test series. He was sent back home for further treatment and later was ruled out of the Test series. “He was the one that bowls the right length and was able to swing the ball both ways. The rest of the guys tend to swing it out more than anything else. And then we lost that extra pace that Dushmantha (Chameera) brings.” Ford told reporters on Sunday. Another star of their series-clinching win over England at Headingley in 2014, Dushmantha Chameera, also left the tour after suffering a stress fracture to his lower back. The right-handed pacer has been advised a four-month rest and is also "likely" to miss the Test series against touring Australia at home, starting from July 26. The Indian subcontinent team faced another blow when Shaminda Eranga was reported for a suspect bowling during the second 5-day game of the tour in Chester-le-Street. He is currently waiting for the results of a biomechanics test of his action which he completed on Monday. The 29-year pacer, however, has not been out of touch so far in the series with picking up only one wicket in 47 overs that he has bowled in three innings. 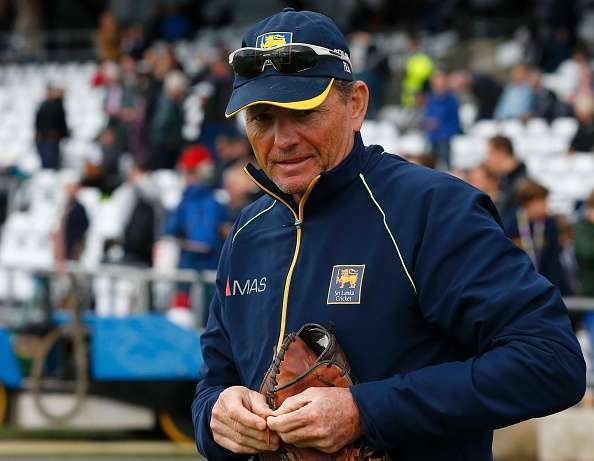 Ford, who is presently in his second stint as Sri Lanka’s head coach, admitted that the lack of experience among the pacers is a concern. “From a firepower point of view, we are perhaps not where we want to be. But we do have a bowling unit that can bowl with discipline, hit their areas, and find other ways of creating pressure. “(Bowling coach Champaka Ramanayake) has been working very hard with them on that. We've had periods where we have created that pressure and stuck to it pretty well. But then we've had other periods when we haven't been like that, which shows that we're very much a-work-in-progress,” he further added. Losing Eranga had been a huge setback to an already depleted Sri Lankan bowling attack on a considerably disastrous tour. If the results of his tests are found to be illegal by the International Cricket Council (ICC), the left-armer Chaminda Bandara could get his first Test cap. He would be joining obligatory seamers Suranga Lakmal and Nuwan Pradeep alongside seasoned spinner Rangana Herath in their attack. After two humiliating defeats in the first two matches, Angelo Mathews’ men will face England at Lord’s on Friday for the final match of their three-match Test series looking for a consolation win. They will then go for a quick tour to Ireland for a couple of One Day Internationals (ODIs), before returning for a five-match ODI series and a sole T20 game against the English.